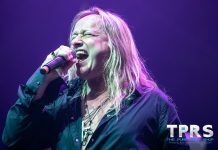 While serving as a strong opener on the Poison Power to the People tour, Slaughter is currently in a state of transition, according to vocalist Mark Slaughter. He says that he doesn’t know how they’ll move forward, but “it’ll be up for grabs” to see where they’re at. In the meantime, they are enjoying themselves as they perform the older material that is familiar to everyone. Slaughter explains that for a lot of newer music the problem is that the awareness is not there. 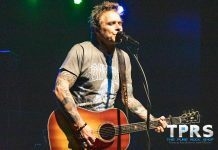 Many people don’t know about their newer material, so they only play a lot off of their Back to Reality album live when they do full sets, because too much newer material throws off the short sets. He explains, “One thing I learned from a Paul McCartney concert a long time ago, he would play the Beatles or he’d play the Wings – the stuff that people knew and loved — and people would be on their feet and he’d try to do something new and everybody sat down.” In addition, Slaughter says “In thirty, thirty-five minutes there’s only so much you can do…” and in most cases there is only room for one newer song. 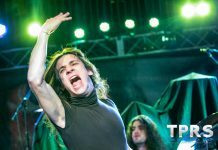 Drummer Blas Elias adds, “I can’t say for sure that we really knew what we were going to do, because we always had the opinion that something that was very special to our band was the fact that it was the same four members when we started, that had been continuing through the whole time. A lot of other bands had changed people and broken up and gotten back together in different configurations, but we never broken up. We’d gone through a lot of stuff together, especially with Tim. We’d gone through his trial and his divorce and a lot of hard things, and we stuck through a lot of things that a lot of people wouldn’t have stuck together through. I think there was definitely a period of time where I was at least personally, I don’t know about anybody else, but personally I was wondering if it could ever go on and feel right. In fact, as the band tried to move on, they offered a moment of silence at each show to show respect for Kelly, which was embraced by loyal Slaughter fans, who had closely followed the band. “If we played a larger arena, it seemed to work a lot better than it did in the bars. A lot of times in bars people had too much to drink, and they really don’t hear what you’re saying or understand what you’re trying to do…People that were there and that knew what was going on and really followed the band, definitely showed some respect in a lot of different ways. They’d bring gifts and they would come to our meet-n-greets and give support and cards and wrote us letters and lots of stuff. They were really, really supportive and definitely vocal about the fact that they wanted us to continue,” said Elias. With a new found strength and dedication to one another, Slaughter went on to join the Rock Never Stops summer tour for two consecutive years. According to Elias, bassist Dana Strum came up with the name but he pretty much gave it to the agency to put together the tour. The line-up had included Warrant, Quiet Riot, Firehouse, Slaughter, and LA Guns in 1998 and Ted Nugent, Night Ranger, Quiet Riot, and Slaughter in 1999. In addition to constantly touring, writing, and recording with Slaughter, vocalist Mark Slaughter has also contributed vocals to a few tribute albums, including a great performance on “Back in the Saddle” on A Tribute to Aerosmith: Not the Same Old Song and Dance (Cleopatra) and a tracl pm Working Man (Magna Carta), a tribute to Rush. Slaughter will be working on working on their next record in the fall and will hopefully have it out by early next year. Check out their Web site at www.slaughterweb.com for tour dates and the latest news.